A membership with the Eastern Ridge Home Builders Association is a three-in-one membership. Not only are you a member of our local association, you are also a member of the Wisconsin Builders Association and the National Association of Home Builders. There are many benefits of membership. Most importantly, business members have instant credibility to consumers by belonging to a professional association. Today, everyone wears multiple hats in their businesses and we work hard to help offer you the tools and resources you need to be successful and promote your business. Any business can be a member of the Home Builders Association. While there are numerous benefits, it is best that you contact the Home Builders Association and request a meeting to learn more. Or, you can complete an application online by clicking here. 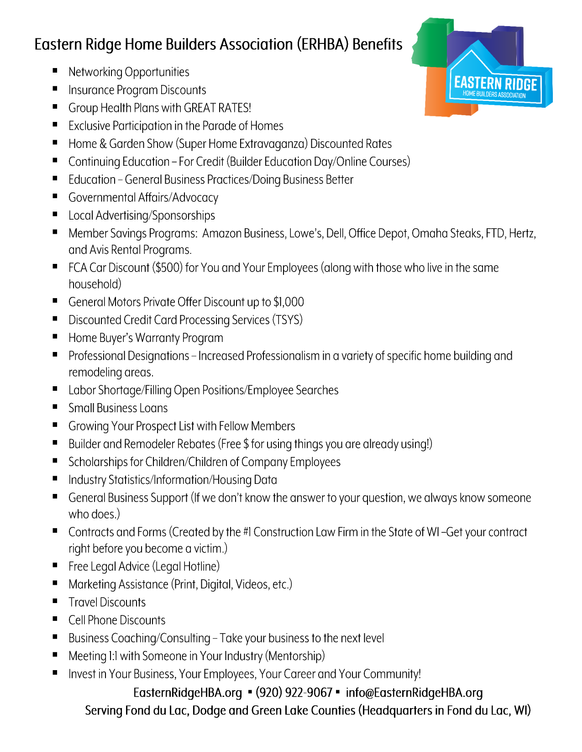 Better yet, email Amanda Kemmel and request a phone call or an appointment to learn more about how the Eastern Ridge Home Builders Association membership can benefit you and your business! For specific benefits of WBA, click here. For the specific benefits of NAHB, click here. Use any of the above products in your new home or remodel? Over 70% of members received a rebate over $1,000 last year with their membership!